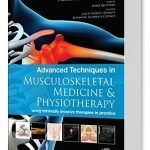 Advanced Techniques in Musculoskeletal Medicine & Physiotherapy is a brand new, highly illustrated guide to the diagnosis and treatment of musculoskeletal disorders. It demonstrates how to safely and effectively use selected minimally invasive therapies in practice. In addition to more well-established techniques such as acupuncture or dry needling, this ground-breaking resource also covers techniques including intratissue percutaneous electrolysis, mesotherapy, percutaneous needle tenotomy, and high volume image guided injections. Other featured chapters include those on specific musculoskeletal ultrasound such as sonoanatomy and ultrasound-guided procedures.